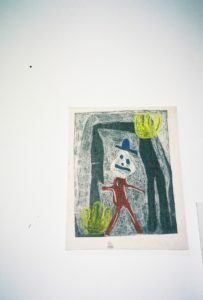 Using printmaking techniques to produce playfully unsettling works. 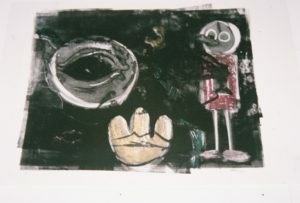 The artist uses recurring common symbols including a hand and a robot-figure to build upon the language of childhood and past memories. Alice Irwin pushes ‘printmaking’ techniques in a variety of forms. 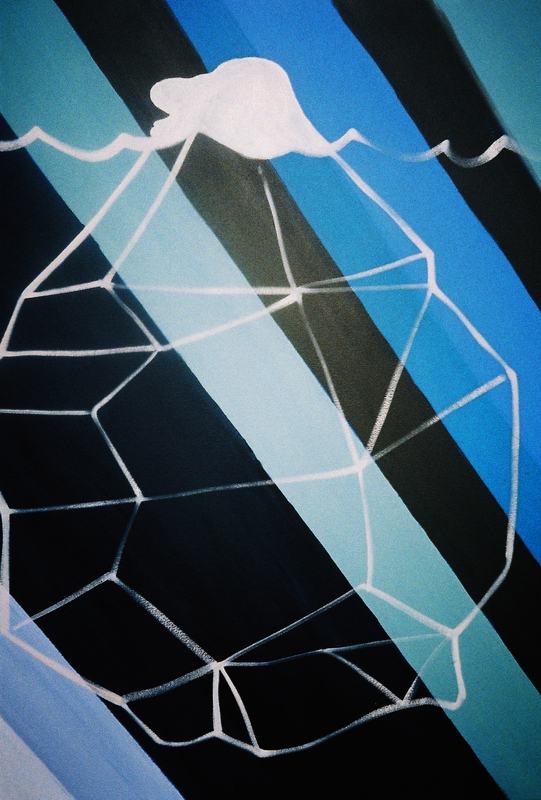 From drawing to installations, her pieces always strive for a handmade quality within a digital context. DATEAGLE ART recently met with the artist at her London-based studio as she prepared for her project based residency at Griffin Gallery, where the artist went through her background, influences, techniques, and approach to art making with us. Alice Irwin (b. 1994 UK) studied a BA Fine Art at City and Guilds of London Art School and an MA Fine Art Print at the Royal College of Art London along with being a member of Arcane Studios, London. She has exhibited widely nationally at Omnibus Arts Centre, Bankside Gallery, SLIUCE Biennial, Q-Park, Dyson Gallery, Flowers Gallery, Brixton East Gallery amongst others. Awards include the Contemporary Art Trust Prize, Norman Ackroyd Etching Prize, Anthony Dawson Young Printmakers Award, The Arts Club: Charitable Trust Award amongst others. She is currently living and working in London while preparing for her forthcoming exhibition at Yorkshire Sculpture Park. You are currently studying at the RCA, London. Could you expand on your background and why you decided to study art? Being dyslexic, I have a big difficulty in reading or writing amongst other tasks, so, when I was at junior school, I was in the art room all the time because I used art as a way to escape, finding everything else difficult. Having said this, art is not easy, but it’s just a way of expressing what you can’t necessarily do with words. I haven’t really had a choice, and it turned into my passion that I just wanted to pursue, and that made me want to apply for my BA course. After that, I decided to go in straight away to the Masters course, instead of having some time out, and for me that was the correct decision because I was still feeling quite unsure about my practise, I was still in the exploring stage, so going straight to a Masters was the right thing for me to do, because it allowed me to open up with my work. Talking with so many tutors with such different approaches allowed me to free up. My work used to be very tight, I used to do very realistic and detailed faces, and then as soon as I started my Masters course everything freed up. I don’t now if it’s because I was quite frustrated or disappointed at the time, and then that just made me rebel a bit, but my work started going in different directions as soon as I got to the RCA. Many of your works involve interaction and participation of the viewer. ‘Pekaboo’, mixed media boxes with squared holes in them invited the viewer to look through the art works, and ‘Playground’ invited participants to join the games, reminiscent of a childhood playground. ‘Wip Party Time’ included a ‘Twister’ game, reminiscent of the well-known Twister game. How important for you is that the viewers interact with your pieces? Is this your initial purpose? Most of the work I’ve been making makes the viewer think that they can play with, but you can’t actually play with. One of my dreams would be to install a massive humongous playground in the Turbine Hall, Tate Modern, London, where you could walk around it, feeling like a child again, and I quite like that idea of the work making you think you can play with, but then limiting you to do so. I’m interested in the uncanny, where something reminds you of something else, but you don’t know what, and I quite like making works that seem playful but there’s something not quite right about them. The playground that I made didn’t allow the viewers to play with the objects, but rather the piece was referencing play. Part of the work that I look at is referencing this idea that we’re all in a journey, and when you’re little, a lot of your learning comes from playing, and then as you grow up, what you’ve learnt through play affects how you grow up and how you interact with people, and that’s why I like that idea of making a playground that you might have played on, but you’re now walking around and it’s like a memory playground. I look a lot at memory, and when you look at the work, memories might be brought up in your head, and you may not like the work or you may like it, but you’re somehow saying ‘this feels familiar’ or ‘I remember when we were…’ it will start bringing up memories, and then that brings up what you want to think about the work. I understand you work in a range of mediums, from prints to posters, passing through sculptures or installations. Counting with such a variety of mediums, all of your works have a hand-made quality in them. Do you consider yourself a ‘craftsman’ along with being an artist? How important is it for you to actually make your own works following traditional methods? I come from a printmaking background; so I am very interested in trying to push the idea of ‘print’ further to expand different mediums. In relation to my sculpture works, there’s always this handmade quality to them such as using an etching technique to make them. Currently, I am working on a sculpture prototype where I’m going to make the sculptures into plastic objects that will be laser engraved, which is a printing technique. I am interested in pushing the craft and ‘handmade’ quality from my works into this digital world that we live now, and keeps on going. 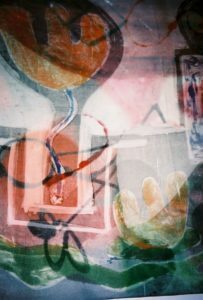 Some of my work is made up in layers, almost looking like they could be part of a TV screen, but they’re not, they’re handmade, so it’s just pushing these ideas of how you see print techniques in other forms, and making people question what they are. In relation to my new prototype, it’s a sculpture, but the method of me thinking about it and making it, being built up in layers, and by using etching processes to make it, is very much print-like. I’m going to hand-paint them, so even though they will be made with modern technology, they will also have a hand-made quality to them. When you learn printmaking, everything is built up in layers. So even if this work is really modern by being made with a digital process, just how I’ve made and thought about it, there’s still a print idea through the piece. What about the recurring symbols in your works, such as hands or figures? I have these reoccurring symbols that are quite playful, such as the hand and the robot-person. 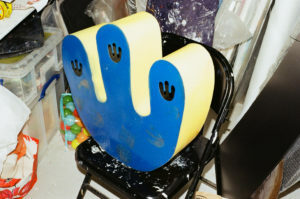 Both of them are quite playful and the hand symbol came from this idea of repetition and symbolism behind the number 3. There’s this well-known saying ‘good things happen in three’s’, or the devil comes in three, then there’s structure within the number 3, like beginning, middle and end. Quite a lot of things happen in threes, and I usually work in series that are built up in threes. That’s why the hand in my works usually has 3 fingers, its because of this idea, and it’s a hand because when you hold a hand you feel reassured, it’s nurturing, and also, I stole it from Matisse and just made it into something else. Then I’ve got this robot-person that originated because when I started drawing, I used to only make faces, and I’m now slowly bringing back this face, but also bringing back a figure. It’s a robot because as time goes on, people are trying to fit into this frame. People are glued to a screen, or there’s things that you have to do in education, you’ve got to tick boxes, you’ve got to be able to pass exams, and then this robot becomes a symbolic person. In a first glance, your work seems very influenced by Matisse’s cut out’s, Karel Appel’s playful depiction of children and animals, or Dubuffet’s primitivism. Could you expand on your references? 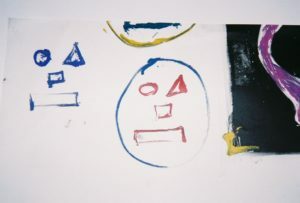 I do look a lot Art Brut, Jean Dubuffet, Basquiat or Matisse, and how Basquiat got children to paint on his paintings before he painted on them. I haven’t done that yet, but I quite like that idea of how something with such basic qualities can tell so much. I’m also looking at Annette Messanger, some of her work is way too dark, but I am interested in how she looks at childhood on a different angle, at a much more darker side, and how she looks at memory or death. Mike Kelley also intrigues me, and his use of soft toys. I don’t like to use physical objects, but I’m interested in how he uses the idea of childhood as well, they’re all slightly uncanny. Do you only work in series or groups of works that are meant to be together, or do you also make individual pieces? Not all the works are made in series, sometimes I do one-offs but quite a lot of times it is either a series or a group of work that makes up a body of work. I do like to work in series, although I try sometimes not to. I think that for me something doesn’t feel quite right until I’ve done three of them, and usually then I think it’s finished, and if its not, then I would usually push on and make six or nine. So, it’s usually either one piece or three, occasionally two. I understand you will undertake a project-based residency at Griffin Gallery, London. Could you expand on that? Yes, in November I’m doing a two-week residency at Griffin Gallery. November is so busy for me, because I’m also going to an art fair called ‘Also Known As Africa’, in Paris. I’ve got a series of prints there, and then, as soon as I come back I’m going to this residency, and it’s a project based residency, so I’m coming up with a project. I’m thinking it’s going to be a new series of works given that it’s a different space, different materials, and I can’t wait just to see what will come up. I’m graduating next year, so I’m still just exploring a little bit with my work, so, I wanted to use those two weeks as a separate project, almost take myself out of all the work I’ve been doing and try something new and see what happens. That’s part of what they want you to do, just to try something different in that project. I’m quite excited; I think it’s going to be a lot of fun. You are currently working on a series of paintings named “Wanna Go For A Walk”. What is this series based on? I’ve been recently looking into different activities people do, like going for a walk, and this is the series that I’m currently working on. It’s based on going for walks, but again it’s also trying to tell a story, and how there’s a balloon, a bird, and a park. I don’t want to spoon-feed you the story, the title is there, but I try to make it quite casual so that you can then interpret something into it. This is the first one of the series; I haven’t finished it up yet. There’s also a robin, because over the holidays my uncle passed away, and he was called Robin, and that’s why there is a robin in the first painting. It’s going to be a series of three, and they’ll all be different. Again, this series is built up in different layers, so it has around four layers. I don’t always work in layers, sometimes I will just do one layer, it just depends on what I’m trying to do with the work, and what I want to say with it, and it also depends on whether the work is annoying me, because if it’s annoying me, then I’ll just keep adding more layers, so if it’s finished then I will stop. You have won the ‘Contemporary Art Trust’ prize at Bankside Gallery with your work ‘Aye’. What did this work relate to? That was a surprise, so I knew nothing about that. I won the Contemporary Art Prize for the work that’s going to Paris to an art fair actually. I’m quite interested in Primitive art, and there’s quite of an African influence on this piece. The work that won the prize is a series of etched faces that I’ve then drawn on with paint. What is quite interesting about this piece is the fact that they are etchings, and some people think they are paintings, but they aren’t. I quite like to leave the audience questioning themselves in terms of techniques and mediums. I won that prize and I was completely surprised, which was quite nice, and I’ve actually been in contact with the people that selected the work, and they’ve invited me to go to their gallery, which will be great. Do you have any future plans/projects in mind you want to share with us? Yes, I have some little things coming up, like a group exhibition at the CGP Gallery, London in February, and then I’ve got the mentioned art fair, the residency at Griffin Gallery, my degree show, and then I will be exhibiting at the Yorkshire Sculpture Park. That’s what I’ve got at the moment, but things keep coming up. Over the summer my work has picked up quite a bit. Ive just finished a commission for Sydney, it’s for a business, and it was a two-meter piece. I hadn’t really worked that big before, and making it was really interesting. I’m also working on some new pieces, but they’re at the Royal College at the moment.